How many participants are expected on this group tour? How do I protect myself from leech bites? Leeches are common in the rain forests of western ghats during monsoon. We advise you to come prepared with leech proof socks. If you do not have one and you intend get yourself a anti-leech socks to protect from the blood suckers, get in touch with any of the team members of Landscape Wizards. Morning – Arrive at Sirsi and transfer to Hotel. Freshen up and have breakfast. We will be starting the trip by proceeding to Unchalli Falls, a cavalcade of water falls which eventually leap into a steep valley to form a spectacular, picturesque waterfall. After spending some amazing moments amidst Nature and feeling what monsoon inside the a wet rain forest feels like, we will head back to Sirsi to have our Lunch. Post Lunch – We will be heading towards Bennehole Falls which is at around 30kms from Sirsi. The road to the falls runs through thick forests which offers some amazing opportunities to make long lasting images. There are numerous streams which run through these forests and offer very good perspectives to make images. After spending our afternoon at this beautiful place we will come back to Sirsi, have a cup of hot tea followed by photo review session. Morning – Today we head to one of the most beautiful and scenic place of the region – Jenukal Gudda. Teeming with shooting opportunities this place is a wonderland for Nature Photographers. We will spend our entire morning at the place shooting amidst the melodious songs of Malabar Whistling Thrushes, which are active in the valley during early mornings. The clouds passing by will bear witness for our excellent photo shoot this morning. After we are satisfied by Jenukal’s beauty, we head towards Magod Falls and enjoy the beauty of the falls. 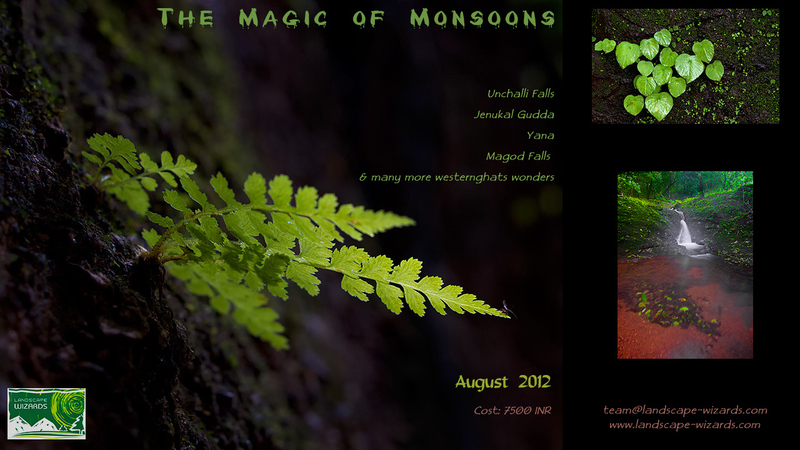 Magod Falls offers some excellent views and the greenery around the falls will be at its best during this time. Once we get refreshed by the beauty of Magod Falls, it is the time to head back to Yellapur for lunch. Post Lunch – We will be heading towards one of the most beautiful falls in Uttara Kannada – Sathoddi Falls. The drive through the forest to reach the place is an experience in itself. The backwaters of Kodsalli Dam offers some excellent viewpoints and photographic perspectives. After spending few minutes at Kodsalli Dam we proceed to Sathoddi. We will spend good amount of time at the falls shooting various perspectives before we head back to Yellapur and then to Sirsi, where we formally end our trip on a happy note. “This photography trip was not just about aperture, shutter speed, exposure or composition, it was more about learning the essence of photography. And by essence i mean developing a photographer in me. I did learn better compositions and exposure but i also gained patience. I moved from being someone who took good photographs by luck to someone who sets up the shots, understands the conditions and then takes the image. The accessories and the lenses provided were very helpful because as a beginner it is not possible for me to have such accessories. I was also very happy with the immediate feedback i got on the images.This helped me in correcting and recapturing the images on the spot.